In this article J & J (Jen and Josie) are going to talk about the three best places that you can escape to this summer. It’s never too early to start planning your summer getaways! We will also mention various places and attractions that you can go to while on vacation at these locations. If your Neopet needs relaxing and maybe an escape from the unbearable heat of the summer months, you have come to the right place because here you will discover what's best to do this summer. Shenkuu is a magnificent city built on high ridges and lies at the far east of the globe. It is an excellent getaway during the hot summer months as it is located at the foot of the mountains and the local people here enjoy the cool breeze that comes from these snowy mountain peaks. Amongst all the activities that Shenkuu offers, you can also enjoy the beautiful scenery of this mystical, oriental place. The locals here are very welcoming and do their very best to make you feel welcome, relaxed and well looked after. We start with the Shenkuu Lunar, which is located on the highest ridge, where you can enjoy the greatest ever seen panorama of the whole city. Here at the temple, lives a wise old Gnorbu who maintains the official lunar calendar for Shenkuu. This is an everyday activity where you are offered a chance to guess where the position of Kreludor lies in relation to Neopia on an astrological map. We recommend a good guide for revealing the exact angle measurement as you will be rewarded accordingly for your specific guess. The shopkeeper at the Remarkable Restoratives is a very sage, old Aisha who sells organic cures for some of our Neopets' illnesses. There is no doubt that we have been using herbs and other organic cures for many thousands of years, probably since Neopians were hunters and gatherers. These basic cures give no side effects because they are natural and many consider them to be Neopia's blessed materials to maintain good health. Kou-Jong is a soothing game hosted by Linae, a young pink Kougra, who is a member of the Cyodrake's Gaze, a ship, which lies on a platform ridge ready to be dispatched anytime. 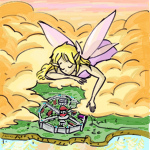 She is also featured in Neopets Puzzle Adventure. Bring a hot cup of tea with you to warm you from the chilly fog and play this relaxing game, matching the tiles, pair by pair, until the table is clear. At the Culinary Concoctions you will find Chef Bonju, who is a very creative and inventive orange Blumaroo who works on the preparation and cooking of special dishes. He made his debut in the Cyodrake's Gaze plot as a crew member and was also featured in Neopets Puzzle Adventure. It was once thought that the Chef Bonju avatar was obtainable by combining the right ingredients in his pot but that is not the case. The Fanciful Fauna is kept by a very skilled, shy Koi who is specially gifted for working with these rare and exotic petpets! Amongst all the petpets here you can find the Sandan which is very curious and will often run right up to anything in greeting. The Kazeriu is said to be a very clever creature and only appears to those who believe in them. The Biyako is known for its hunting skills and for being a very quiet and timid petpet. The Blurgah will usually support their Neopet no matter what the situation and the Juma which has soft coat and is very playful. All these petpets and more can be found here and nowhere else in Neopia. Which one will you take home with you this summer? Orrin the red Nimmo is the shopkeeper of the Exotic Foods store. He is always busy loading up foods in his shop and happy to help you choose the best suited foods to tease your taste buds. Food sold here is intriguingly unusual and excitingly strange. Perhaps you would like the Cherry Onion Blossom which is very sweet or the Cyodrake Roll which is very tasty. There is the Ginseng Popsicle which will definitely give you energy, the Moshi soup for extra warmth and the freshly squeezed Stramberry Juice. Mmmmh! Lovely! The Wondrous Weaponry shop is kept by Kentari, an Orange Shoyru. He was the Weapons Handler onboard the Cyodrake's Gaze and helped in the search for the ship's missing navigator, Hoban in the Cyodrake's Gaze plot. He is also featured in Neopets Puzzle Adventure. Kentari is a serious type of guy that specializes in weapons. He is usually found cleaning and organizing all types of weaponry and can always assist you to choose the best weapon to fit your needs. At Noda's Fortune Cookies shop you can buy freshly prepared fortune cookies made traditionally from Noda's grandmother's recipes. Unlike all other shops here at Shenkuu, Neo Cash (bought with real money) is used rather than neopoints and when you visit his stand, you'll see what cookies are currently available, as well as their prices. Different types of fortune cookies unlock different effects and so far have ranged from extra lab zaps, shortened training time, extra faerie quests, exclusive wearable items and more neopoints while playing games. Finally there is the Mysterious Negg Cave which is located high in the mountains of Shenkuu. This place was discovered very recently and is an activity that any Neopet can do. Inside the cave lies a simple grid-based puzzle in the form of a clockwork Negg, which you can attempt to solve once per day to collect the prize inside. No wonder so many travelers come to see this extraordinary and peaceful place, where the waterfalls and natural sceneries never cease to exist, making this vacation wonderful and unforgettable. At this point we recommend you would look out for more things to do in this fantastic land of Shenkuu and wish you a very nice stay! Our second attraction is Mystery Island, which is a tropical island, and the largest island in Neopia. It is absolutely amazing, surreal and dreamlike and is an incredible place that offers relaxation and plenty of attractions during summer time. Mystery Island is known for its native habitants called the Coconut People and at certain times one can hear their mysterious chanting coming from far away. It is also known for its huge volcano, Techo Mountain and the origins of the Kougra species. The Cocos were shown to worship an island deity known as Mumbo Pango and sacrifice here was a common ritual. Rumors suggest that these natives may have practiced cannibalism although most of them are wonderful and friendly and have managed to keep this fantastic island attractive and unspoilt. In a hut on Umbuku Island, which lies north of Mystery Island, is the Island Mystic. Here, an elder Kyrii will read your fortune for the day, that is if you can make sense of his frustrating riddles! The Island Mystic avatar can be collected here! Good luck! Playing Gadgads Game can reward you with its nifty avatar, if you manage to score high enough. Use your arrow keys and space bar to rotate and move strings of fruit. Group fruits of the same kind together as much as possible and use the power ups to explode them, collecting points along the way. It’s game over if your pile reaches the top of the screen! Facing the splendid beaches, you can see another Island, which is the Rock Pool. The keeper is a yellow Kougra who has managed to gather many petpets from the destroyed old Maraqua. He now sells them here in the hopes of finding them a loveable owner. The Tiki Tour Guide is one of the Coconut People, who is believed to be a Jubjub, although this has not been confirmed to be true. For just twenty-five neopoints you can let this guide give one of your pets a tropical tour! Your pet will experience the full glory of Mystery Island and will increase its happiness. You can even leave with a nice avatar as a souvenir of your visit! Kitchen Quest is another fine attraction where you can find a Flotsam who is always busy cooking very, very large meals for the great Mumbo Pango. Please help him cook and satisfy this immense appetite otherwise he'll be turned into soup. Poor Flotsam! At the beach you can play Mynci Beach Volleyball, which is a great game to play. The object of this game is to simply get the ball to the other side and have it hit the ground. Many power ups make this game even more fantastic and if you can score high enough you will get the Spike It avatar. The Tiki Tack Man runs the Tombola down on Mystery Island. This is a daily activity that anyone can play to win neopoints and other prizes. This game gives you a raffle ticket and if you have a number ending in zero, two or five you are a winner. You may also “win” booby prizes or a few neopoints occasionally if you get a losing ticket. You may want to take extra precautions when travelling to see Techo Mountain as the air here is stuffy and very hot. Wear light clothing that is not flammable; this is a volcano after all! The volcano has a giant carved head of a Techo upon it. Nobody knows who did this, as it has been present on Mystery Island for as long as anybody can remember. Many Neopians believe the carvers were Techos, shaping the mountain into their own likeness. When you visit this mountain you are presented with a chance to exchange normal codestones to the red ones so that you can pay for lessons at the Secret Ninja Training School. To truly get the Island experience you must visit Jhuidah, the Island Faerie at the Island Mystic Cooking Pot. Here you can mix an assortment of items together to make new and wondrous things! If you are lucky you can discover the secret to the Bonju avatar here. If you need some relaxation you can simply go to The Beach. This corner of Mystery Island is quiet and pleasant for Neopians who want to spend some quality time either reading, swimming or simply sun bathing. There are plenty of palm trees to provide shade, soft white sand to build sand castles with, and three majestic Tiki Head Statues in the distance. Some Neopians become restless if they don't do enough while on vacation. Relaxing isn't an option for these individuals. If you are such an individual, why not pay a visit to the Training School or the Secret Ninja Training School? The Training school only requires you to pay in codestones in return for a lesson with the Techo Master. The stronger you become the longer you can train but once you reach a certain level you must seek wisdom elsewhere. Now that you are too strong for the Training School it’s time for you to search for the Secret Ninja Training School. It's so concealed, that there is no sign to tell you where to find it. You'll figure out the way if you are strong enough, don't worry! We will leave the rest of Mystery Island for you to discover and assure you that you will never forget such a wonderful experience. We now, finally come to our last place you dare not miss during the months of summer. Terror Mountain is the final vacation spot we suggest you go to this summer. It is located on Neopia's northern ice cap and is a place of varying terrain. The weather forecast is announcing a very hot, dry summer this year and travelling to Terror Mountain would be the best way to beat the heat as it is always cold and snowy up on the mountain. Terror Mountain is divided into three areas. Happy Valley is the first area you will arrive in and there is much to see and do here! While looking upon the Valley you will see cozy looking buildings with smoke coming out from the chimneys. Come inside a few and see what there is to do! Maybe have a cup of warm tea by the fire too! The Scratchcard Kiosk is run by a very jolly, young Wocky and you can buy a scratchcard from him every six hours. This kiosk is closed from 9-10am and from 1-2pm NST. Good luck winning the jackpot! The Slushie Shop is run by a happy striped Eyrie who will tantalize you to buy as many slushies as you want! Which ones do you like? Pineapple, kiwi, lime, green apple, mango, raspberry are just a few of the fruity flavours you can choose from. There are also some rather odd flavours like peanut butter, chocolate chip and cheesy pizza to name a few. And of course, there is the snow slushie, which is simply snow, in a cup. Maybe you want to go and have a Snowball Fight with a variety of Faeries, Neopets and petpets before you leave on your way to the Ice Caves. Dieter the Polarchuck (or so we guess as it can't be another) glides down the screen with a parachute and if you hit him, he gives you more snowballs to play with. Just make sure you don't hit the Faeries as they will take ten snowballs away from you each time you do! When you arrive in the Ice Caves you can see the ice sparkle and twinkle as rays of sunlight peek through the cracks and holes in the skies above. All kinds of wintery Neopets and petpets play around you. What a beautiful sight! There is plenty to do here as well. You can visit the Snowager a few times a day, to try and get a prize or perhaps achieve the very elusive avatar, Snowager - Rawr! When can you visit? That's for you to find out! After being blasted by the Snowager maybe you would like to go and colour some lovely Terror Mountain themed pictures. This way you will dry off and thaw out from the ice blast and once you are warm again you can explore the Ice Caves with Hannah and Armin in the Hannah and the Ice Caves game. You could also go and eat blocks of snow in Snowmuncher, meeting Dieter one more time and dodging snow Wurms to score points. If you score high enough in Snowmuncher you can get another avatar! The Neggery is run by the Negg Faerie, Kari or when Kari is away running the Negg Festival in Spring, Zaira takes her place. Kari is a one-of-a-kind faerie, she is always kind and nice and ready to help everyone that comes to her aid. Her little negg shaped hut is a great place to go to and cash in all those neggs you get from playing Key Quest. Kari will substitute these neggs with points. You can then exchange them for more interesting, special, powerful and magical neggs. There are many neggs to choose from with points ranging from four negg points for the Happy Negg, Darksplash Negg Bomb and Swift Darkfire Negg Bomb all the way up to the Cool Negg for two hundred and forty-seven negg points!! After leaving the Ice Caves we travel up to the Top of the Mountain where it never stops snowing. It’s quite chilly up here so you might want to get that sweater you packed out now! Tarla, a red Ixi, awaits you in the Shop of Mystery where you can choose a mystery package. What’s inside? Ohhh, I can’t wait to find out! Don’t forget to visit Donny, the Red Bori, in his Toy Repair Shop if you have any broken toys. If he’s in a good mood he might even fix things for free! Next come the two Chias, Mika and Carassa, who never close their Garage Sale Igloo, not even at night! When do they sleep? No one knows! You can even play a game to help them get all their things from the attic for the next upcoming garage sale. Remember, the yellow Chia upstairs is Carassa and the blue Chia downstairs, the one who's trying to catch everything, is Mika... WATCH OUT! Don't catch that piano, Mika! While you're here, remember also to do a few quests for Taelia. She is wearing a soft, thick fur coat ready to search for Neopets who get lost in the snow, but usually doesn’t go outside unless she really needs to. These attractions are only just a few of the many, many things you can do while visiting Terror Mountain. There were just too many to mention all at once! There are many more places to go and many more things to do at every destination. We hope we have given you enough information to have the best vacation of your life this summer! Day after day, time flies away and summer will come to an end. So long are the goals set before summer solstice and so near is the next coming season with its first rain showers and orange colours… and summer will soon be just a memory of our experiences, adventures and a quickly fading tan.